U. S. Federal Census legends. Ancestors appear in this face, children of Oliver and Selinda in their own households in this face. Dittoed fields (e.g., surname, occupation, place of birth) are shown as the original reference. 24 April 1999, revision 1. 06 January 2001, revision 2. 08 October 2001, revision 3. Added 1910, 1900 Huntington census, 1870, 1860, 1850 Black Brook census. 02 March 2003, revision 4. 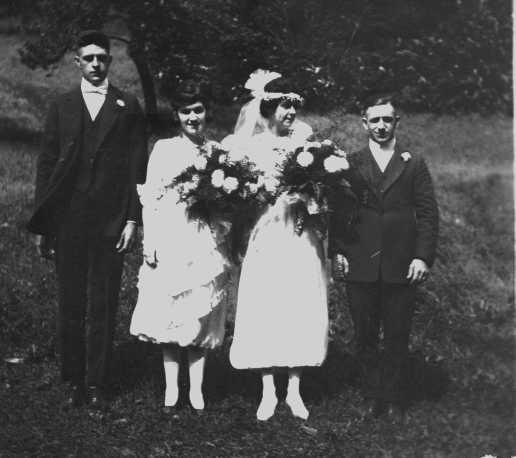 HTML debugged, added Eva Laramee wedding photo. 11 March 2003, revision 5. Added 1900 and 1910 Pittsfield census entries. 20 March 2003, revision 6. Added 1850 and 1880 Black Brook, 1920 Pittsfield census entries. 14 November 2003, revision 7. Added photo of Oliver and Selina. 25 February 2007, revision 8. PLACE OF DEATH Hampshire, Huntington, Worthington Rd. Length of residence 46 yrs. BIRTHPLACE OF FATHER Black Brook, N.Y. BIRTHPLACE OF MOTHER Black Brook, N.Y. INFORMANT Mrs. Francis Laramee, Huntington, Mass. PLACE OF BURIAL OR REMOVAL St. Patricks Cem. Hinsdale, Mass. NAME OF FUNERAL DIRECTOR H. W. Hanson Huntington, Mass. This is a transcription of U. S. 1920 census (as published digitally by Ancestry.com) entries for Oliver Laramee and the families of several of his children and present and future children-in-law. The naturalization entries for Elizabeth LaFond are interesting. There's a mark like a tall narrow caret or a malformed "X" in the "Year of immigration" field, and what appears to be "al" (i.e., alien) in the "Naturalized or alien" field. Even though she was born in New York, perhaps she lost citizenship by marrying an alien. The Main St. - Worthington Rd. transition is a little ambiguous, so it's not certain which street the LaBombards lived on; but it's interesting to note that they all owned their homes free and clear. The literacy entries for Oliver are suspect; Mom remembers him reading French. Eva's occupation is only partially legible, without enough context for a sure guess - have a look and tell me what it is. New York Canada Fr. Canada Fr. Selinda Wife F W 58 M1 42 15 9 New York Canada Fr. Canada Fr. Canada Fr. Canada Fr. Canada Fr. N. Y. N. Y. N. Y.
Julien appears in the Ancestry.com index as "Anpuee." 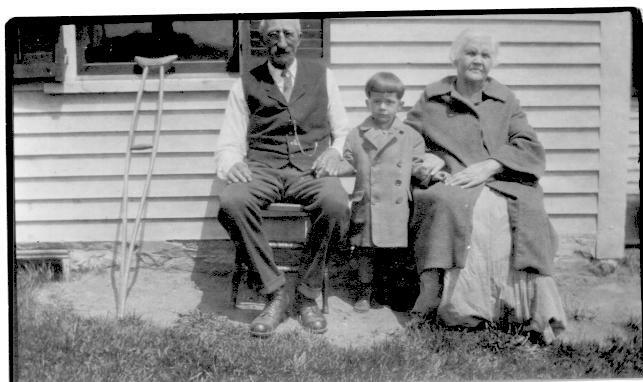 Left to right: Francis William Laramee, Margaret Dorothy Aldrich, Eva May Laramie, Raymond Clifford Aldrich. Huntington, 1 September 1920. Left to right: Oliver Laramee, grandson Robert B. Aldrich (probably), Selina (Disco) Laramee. Circa 1925. Published Monday, 26-Feb-2007 00:04:43 EST. Copyright ©1999-2019 Raymond W. Scanlon.